A slow or clogged drain can be more than just a nuisance in your home. It can harbor the growth of harmful mold and mildew and lead to overflowing toilets or sink basins that might cause significant water damage to your home. If you’ve noticed that you need service on your drainage pipe, don’t hesitate to call Lex’s Plumbing to unclog the drains in your Frisco home. We have over 10 years of experience providing Frisco with superior drain cleaner service. Our technicians will offer prompt and friendly service while identifying the best solutions to keep your pipes and drains in working order. Whenever you notice signs such as sinks or tubs failing to drain water, an overflowing or clogged toilet, musky odors coming from the drain, or slow or standing water, you will want to call Lex’s Plumbing so we can perform a thorough drain cleaning for you. Different types of drains and pipes might require varying solutions to clear, so using a DIY approach to clean clogged drains may cause more harm than good—especially if you utilize harsh chemical drain cleaners that might damage older pipes. When it comes to your clogged drainage system in Frisco, you should let the professionals at Lex’s Plumbing handle the pipe unblocking and sewer cleaning for you. If you have started to notice any of these troubling signs occurring in your home, we highly recommend that you don’t ignore them. Lex’s Plumbing is here to help, and we can determine what the best solution is for your specific problem. We provide thorough professional drain cleaning, so you can rest assured that your problem will be fixed. When we come to do sewage cleaning for you, we’ll first use a sewer camera in order to see into your sewer line. Once we identify what the problem is, we’ll utilize our rooter service to unblock your sewage line so it’s clear once again. Lex’s Plumbing can handle any drain clog, big or small. 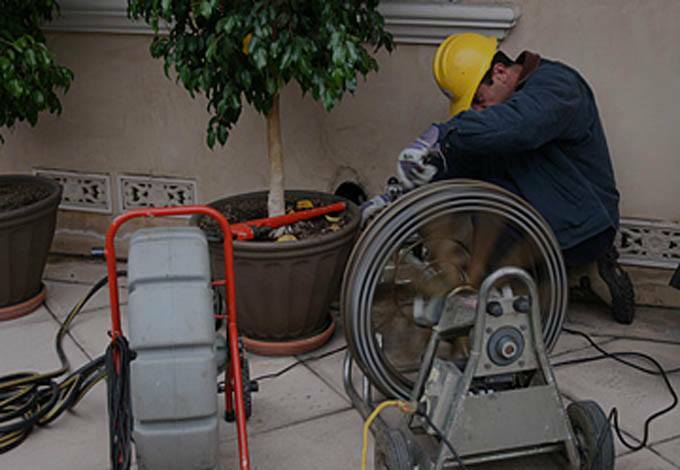 We will address every problem promptly to reduce any further damage and provide you with the comfort and convenience of properly working fixtures. Here’s a look at the types of drains we can clean on your property in Frisco. Kitchen drains – Even with a garbage disposal installed, kitchen drains do a lot of work and see all types of food residue and soap scum that might produce a clog. Backup in the kitchen sink might also cause leaks elsewhere in the drain system, so calling a professional is the best way to ensure that the problem is resolved for good. Bathroom drains – From soap and shampoo to toothpaste and grime, bathroom sinks and tubs are filled with a wide range of drain clogging materials. Toilet drains may also become overwhelmed, particularly when items like baby wipes and feminine products are improperly flushed. Utility and outdoor drains – Floor drains and downspout drains can be integral to flood prevention in your home, but these drains may also become clogged with dirt and debris that may cause foul odors to permeate into your home. Taking care of clogged drain pipes in a timely manner can help you to avoid bigger problems and more costly repairs. Having your drains cleaned regularly and installing a garbage disposal can also help you to prevent future clogged drains. Additionally, you should be mindful of cleaning any hair and soap from your bathtub drain on a regular basis. However, regardless of preventative measures, our professional and expert plumbers are here for you when a clog does occur. If there is a more significant problem in your pipeline, we will find it when we go in for sewer cleaning. Regular drain cleaning is also a huge help to avoid recurring problems and for keeping the integrity of your system strong. If you are in need of a plumber right away for clogs and other common residential plumbing problems, call Lex’s Plumbing today at (469) 362-5397. We have more than a decade of experience handling projects of all sizes, and we are recognized by the Better Business Bureau, Angie’s List, and the Frisco Chamber of Commerce as an outstanding service provider. Let the professionals unclog your plumbing: (469) 362-5397.